Spending your life staring at a (traditional) computer screen may not be ideal for your eyes (and more); so since an early age I have been dreaming of a “purely mechanical” monitor that you could stare at more or less indefinitely, like at parchment. This dream is now becoming reality, sort of. The Dasung E-ink monitor has no backlight and instead reportedly uses electric flows to move ink droplets. After some consideration, spending yet more hours reading reviews online and watching youtube videos about it sealed the deal. I shelled out $1300 and bought the thing. I have had it for a few days now and I am sort of happy. I went from using a giant 30-inch monitor far away (my theory for avoiding eye strain) to using a ~13-inch monitor at pretty much the same distance as reading a book. I had to avoid sunlight, now I seek it (see the picture). The monitor makes your computer look like Windows 3.1 on a monochrome screen from the 80’s. The refresh is slow, and there is a ghosting effect, meaning there are shadows of previous images — which you can clear out. Also, it’s 4:3 instead of 16:9, which is a pain because it means I have to change resolution when I am forced to use my other monitor (for example if I have to check colors — the screen is gray-scale, did I mention that?). It makes browsing the internet quite painful, which is a nice side effect. Contrary to advice, I am using it as my primary monitor. I am sort of happy with it and don’t regret buying it. I have started writing and reading papers with it and it’s working well enough. I think as soon as the technology improves the market for these things will be huge. Already having a 17″ monitor in 16:9 ratio, ideally touch-screen, even if gray scale, would be a dream come true. I vowed to quit with marijuana, but I just can’t. It’s addictive. A town voting to legalize marijuana may MUST open pot shops. At the same time, the administration of Newton changed. Councilors who liked the place the way it is and wanted to protect it lost to others who wanted it more vibrant. The new councilors and the new mayor sided with the marijuana industry. The way in which they eventually won is sinister. The context was that everybody in Newton wants at least some restriction on the number of marijuana stores. But don’t take my word for this claim: even the pro-pot councilors believe so, and in fact almost unanimously they put a question on the ballot about restricting the number of stores. At the same time, many people in Newton wanted zero stores. In another masterstroke of the saga, the councilors were able to put one group against the other. They added another question about having zero stores, following a massive, grassroots petition which however should have put the question at a different time. Then they forced the people who wanted zero stores to vote against restricting the number of stores. This is genius. Also, if it isn’t illegal I believe it should be. And in perfect coup style, media outlets censored several pieces explaining the situation to the voters. The end result was what the administration had always wanted: no restriction on the number of stores. Ignore the alarms of the doctors, the police officers, and the people. What do they know about what’s best for Newton? The bottom line is that the revenue will do good things for the city! Oh yes, the revenue. Newton has 1 billion dollars in deficit. You read well, 1 billion. For decades we will have a fraction of the city budget wiped out to repay that. I guess they can say we are so desperately in debt that we should rake in every penny we can zone in town. But I think a more accurate perspective is that even in their wildest dreams, cannabis sales won’t make a dent in that. And maybe they should spend a couple of minutes thinking about the dozens of other ways we can bring money to the city without bringing the drugs. Executing their sophisticated plan cost in the neighborhood of $100k, mostly spent on a political strategy group which helped win the election. To add insult to injury, key members of this marijuana combine, including the political strategists and those who funded them, don’t live in Newton but in towns where recreational pot stores are banned. The marijuana combine is effectively carving out suburban Boston in areas where it’s good to live and areas where it’s good to sell pot. As is well known, nobody has any problem with legalizing marijuana consumption. Moreover, there is absolutely no problem with buying this stuff over the internet, or stocking up at out-of-the-way stores. Well, absolutely no problem except one. The money wouldn’t go into the pockets of X, Y, and Z.
I haven’t breathed (freely) since 3.5 years ago. Precisely since the day before I left my Cambridge flat, when the Pods guy told me he couldn’t park. I had to vacate within 24 hours, had no place to put all the stuff I had never used since moving there in 2008, and also happened to have a 3-hour CPR course planned long ago, starting in minutes. I took that life-saving course on the edge of the seat, each 5-minute break dashing out to call movers who might have had an unlikely last minute cancellation in the busiest day of the year (August 31). Oh the times I wished that the fireproof storage where the things eventually went burned down to the ground. Instead I was going to have to move my never used belongings a million times up and down stairs. Anyway, after Cambridge I went to the Simons institute. Even with all the help from the staff, finding housing was atrocious, and I had to change it during the semester. I didn’t have a place to come back, and from Berkeley I eventually found a short-term rental in Needham, MA. The idea was to buy a house in that short term. This proved impossible. So we had to find another rental. In the process, I was discriminated against three times. One time the landlord rejected in writing my application claiming that they did not want to rent to families. The other two times the landlord simply rejected my application, and then lowered the price. I thought these moves made them dumb, but maybe they are actually much smarter than me, because after toying with the idea I did not, in fact, sue. Eventually we found another longer-term rental. From there, with more excruciating difficulties I wrote about earlier, I bought a house, which however required 1 year of renovations (not exactly cosmetic — more about this later). These were completed just in time to store my useless stuff there: I left for another semester at the Simons institute. My second visit to the institute was also great. In fact I enjoyed it even more than the semester on fine-grained: I was there for the program on lower bounds, which are exactly the problems I went into computer science to study. I had the best time, and lots of research exchanges. But again, the housing situation in Berkeley was desperate. Twice I lost a house for 1 hour. Meaning, the landlord called to make the deal, I couldn’t pick up the phone, and when I called back 1 hour later the place was gone. I still think it would be better if the institute bought a block of houses, and also provided computers. Even better if they make it easier to print, rather than having to stand in a corner or go through a complicated set up. Another interesting pattern is that during my first visit there was a heat wave and the AC broke, and it was hot. This time there was a rather serious wildfire, causing very unhealthy conditions in the bay area, and at times they couldn’t run the heating systems to avoid sucking in the smoke, and it was cold. Berkeley isn’t Princeton, but it’s hard for me not to compare the logistics of my visits to Simons and the IAS in Princeton. In the latter I was put in a house steps from the Institute, with minimal effort and at a fraction of the price. In my office there was already a working computer, connected to a printer. Here’s the meaning of cloud computing, remote desktop, telnet, etc in 2019, here’s the progress, the sustainability, the sharing economy: everybody brings their own laptop. Back from Simons, I can’t help but be surprised that I still have an office. In fact this happens every time I go up the stairs, turn the corner and see my name on the tag, and it says “Professor”. Really? Under my name? I have a startle each time. I know this feeling is irrational, but is there. Coming back from California, the feeling is intense. Back to business, I am now teaching algorithms. I am running an online section, for which I am making videos on my youtube channel. It’s the future. Yesterday at the Simon institute there was a fun talk about The edge of physics by its author, Anil Ananthaswamy. To divulgate the theory of computation isn’t as easy, since you can’t talk about mega experiments done at the South Pole or massive telescopes built on top of mountains. (It would also be a lot easier if we could resolve P vs. NP.) For some inspiration we can look at books related to mathematics. Here I would like to recommend Symmetry, by Marcus du Sautoy. I enjoyed very much reading and re-reading this book, much more than his previous book The music of the primes, which I don’t really recommend. Symmetry is a gripping history of group theory. The purpose isn’t so much explaining the math as making you excited about the historical developments of the theory and the people that worked and are working on it. If you are applying for a PhD in theoretical computer science, you may want to check out my homepage, to see what my team and I are up to, the theory group at Northeastern University, and where we stand in the rankings. (For a discussion of csrankings see this previous post.) If you think there is a match write my name on the application. Congratulations to the marijuana industry and the Newton MA administration for rigging the elections and pouring > $70K into a campaign strategist who lives in a neighboring city where recreational pot shops are banned, thereby snatching a narrow victory and shoving marijuana down the throats of Newton’s residents. When the pot shops open, owned by people who live in the same neighboring city which does not have them, I’ll have a toast to you with a marijuana drink. Well, I think I am taking a break from politics, at least until I have a stronger financial backing. I have a bigger impact on society with my research. Even if you don’t live in Newton, MA, it may interest you to know how the marijuana industry is doing everything it can to win this ballot, including rigging the election twice (one and two), and even hiring a national, professional political consulting company. To know more see the opt out website. Static Data Structure Lower Bounds Imply Rigidity, by Golovnev, Dvir, Weinstein. They show that improving static data-structure lower bounds, for linear data structures, implies new lower bounds for matrix rigidity. My understanding (the paper isn’t out) is that the available weak but non-trivial data structure lower bounds imply the available weak but non-trivial rigidity lower bounds, and there is absolutely no room for improvement on the former without improving the latter. Toward the KRW Composition Conjecture: Cubic Formula Lower Bounds via Communication Complexity, by Dinur and Meir. They reprove the bound on formula size via seemingly different techniques. Lower bounds are true, and provable with the bag of tricks people are using. The above is just coincidence. Given the above examples (and others) I find this possibility quite bizarre. To illustrate the bizarre in a bizarre way, imagine a graph where one edge is a trick from the bag, and each node is a bound. Why should different paths lead to the same sink, over and over again? Lower bounds are false. That is, all “simple” functions have say formula size. You can prove this using computational checkpoints, a notion which in hindsight isn’t too complicated, but alas has not yet been invented. To me, this remains the more likely option. After the historic signature collection there was a pitched battle to decide which questions to put on the ballot. Alas, the battle resulted in somewhat of a defeat for the residents of Newton. The councilors of Newton saw it fit to put two conflicting questions on the ballot, and to resolve the conflict by stipulating that if both questions pass, the one with the highest number of yes votes will prevail. As explained below, this forces residents to strategize, take a risk, and in a way answer questions against their true preference — a well-known, and bad, situation in election theory. Question 1: Shall the City adopt the following general ordinance? All recreational marijuana retail establishments shall be prohibited from operating in the City of Newton. Councilors unanimously approved the inclusion of this question on the ballot. Question 2: Shall the City adopt the following zoning ordinance? The number of recreational marijuana retail establishments shall be not fewer than two (2) nor more than four (4). Councilors approved the inclusion of this question on the ballot by a vote of 11 to 10. If you want to put another question on the ballot besides a simple YES/NO question, then you should first collect 7,000 signatures. I doubt they could have even collected 70 for Question 2. But the real problem is the rule I mentioned before, that if both questions have a majority of yes votes, the one with the highest number of yes votes will prevail. To illustrate, consider the following realistic scenario. Suppose that a resident of Newton loathes recreational marijuana establishments. When they go to the ballot, they obviously vote yes on Question 1. What should they do about Question 2? If Question 1 loses, they are better off if Question 2 wins. 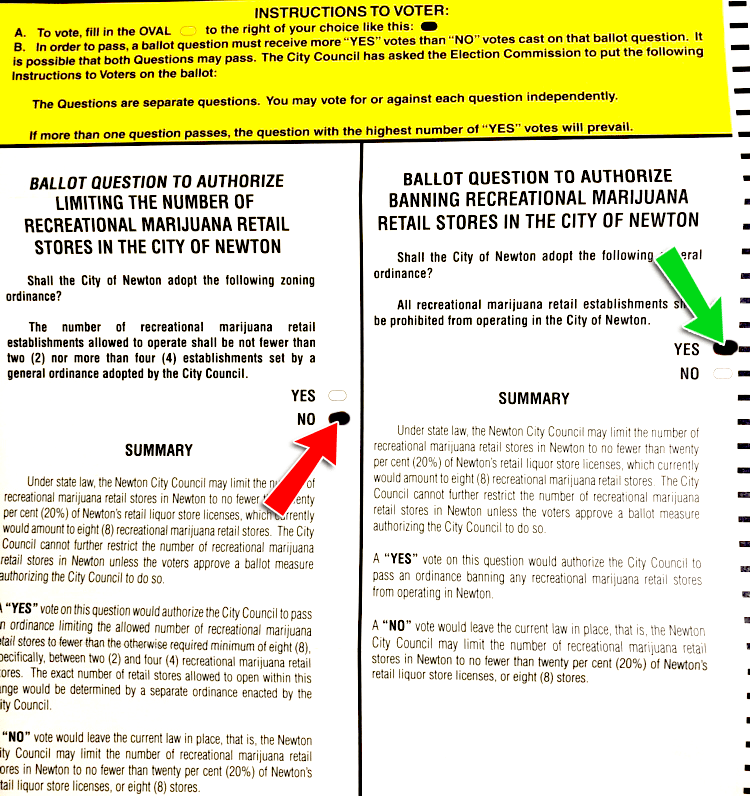 Suppose they also vote yes on 2, and that 99% of Newton residents behaves this way. Then it’s enough that a merry 1% band of business(wo)men vote no on Question 1 and yes on Question 2, and they harness all the votes that people cast to their own advantage. There do exist fair ways of having both questions on the ballot, but this isn’t one. The current setup forces people who really want to ban recreational marijuana to strategize by voting no on question 2, and risk that if Question 1 loses, they end up with unlimited recreational stores. Question 1: Do you want to ban torture? Question 2: Do you want to limit the amount of torture that can be inflicted upon you? Default: Unlimited torture can be inflicted upon you. If both Questions 1 and 2 have majority Yes, the one with the highest number of yes prevails. It is not going to be easy, but it seems that in the upcoming campaign we will have to convince people to answer ‘NO’ to question 2.